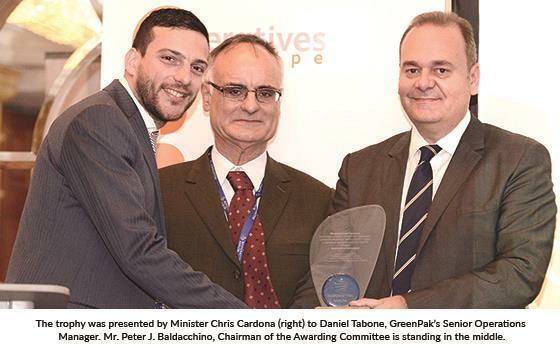 GreenPak Cooperative was presented with a Special Award during Koperattivi Malta’s 20th Anniversary event. Koperattivi Malta, a non-political organization, promotes the co-operative business model and its social responsibility dimension. GreenPak was judged to merit this award for bringing together a large number of companies to finance vital waste recycling services to the community despite that they are engaged in business competition between them. Other criteria mentioned for granting the award to GreenPak included its consistency in achieving positive results, for championing the merits of education in recycling and for distinguishing itself in the ability to lead other businesses to adopt sustainable practices. Two projects that stood out were GreenPak’s ‘Nirrickla ghall-Istrina’ and ‘Irrickla u Irbah’ educational campaigns. For the past six years, GreenPak has each year promoted schools and businesses to collect plastic caps. Millions of caps are collected and the proceedings go towards a charity campaign called ‘l-Istrina’. The altruistic links between recycling and helping others is a strong feature in this campaign. The ‘Irrickla u Irbah’ campaign, now in its 7th year, promotes recycling by randomly selecting members of the public with token gifts. GreenPak’s innovative approach has led to the wide acceptance of the Extended Producer Responsibility model at many levels and is now an integral element of Malta’s environmental policies.